Even thought the Labor Day holiday signifies the end of the summer, Rihanna continues to build off her summer 2015 Puma buzz with a visual reminder that the fashion Queen has some dope stuff in store for fall. Puma’s Creative Director took to her Instagram page to kick off another part of her 'Forever Faster' Puma campaign which features her hit single “BBHMM” and asks, what are you training for? This also marks our first look at a video to go along with the ads we've seen popping up over the last quarter. 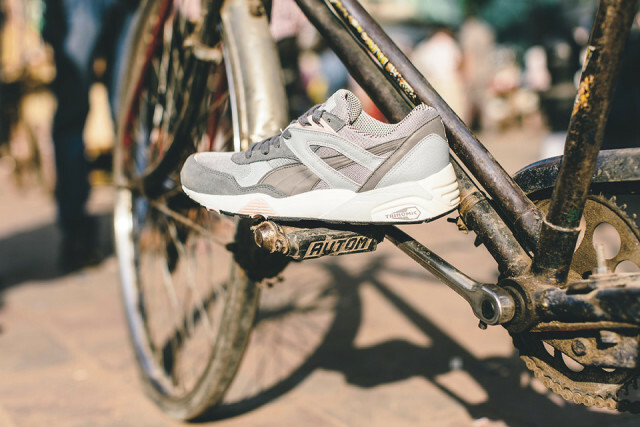 Are you excited for Ri's Puma's collection? Before making a run for it from pesky fans with camera phones, Rihanna and BFF Melissa Puma crept through NYC in their Puma Creepers. Rita Ora kicked off her newest adidas collaboration in full gear. The singer rocked her Rita Ora x adidas Superstar 80 "White Smoke" along with a matching hoodie and leggings. Hannah Bronfman just keeps popping up in these Converse Classics! We're not complaining though! Cutie pie Leauxsteez makes her CNK debut in a burst of adidas. The Cali girl kept it colorful Rita Ora x adidas Super Shorts, Super Crop Tee, x adidas S-M-L Sneaks in Bold Blue. Leave it to Gigi Hadid to make working out look like perfection. The stunner stepped out with pal Taylor Swift for an afternoon run in New Balance Accelerate Tights and a pair of Type A6 Runners by Saucony. Airport life is an everyday thing for Karlie Kloss who traipsed through the airport on her way to Cannes wearing Superga 2750 Cotu Classics. Rihanna has a knack for casual pairings. The singer ran errands in Puma Cargo Sweat Pants, a New Era X Rocnation Paper Plane Old School Cap, a Phenomenon Hockey Sleeve M-51 Parka Shell Coat, and Puma Carson Runners. LAX found Meagan Good and Christina Milian waiting for their bags after a long trip abroad. Meagan kept it casual in sweats and Air Jordan 9 Retro "Barons" while Christina opted for jeans and the Air Jordan 1 Reto "Pearl." Jordin Sparks smiled for a mirror selfie and we couldn't help but notice those Melody Ehsani x Reebok Blacktop Pumps. More sneak action from Christina Milian! The singer was flying high atop a roof in DTLA in those hard-to-miss Nike Air Max 90 Hyperfuse in Volt. We love Aleali May! The stylist paired snazzy plaid separates with the three stripes - adidas Originals Superstar 80 DLX. It's been awhile since we've seen Leona Lewis! The singer made an appearance at Buzzfeed HQ in a pair of Nike Roshe Runs. The monochromatic shot released by Puma via it's Twitter account will pretty much make you salivate and wonder how Rihanna could possibly make a Puma visor and running tights work because she totally does. While we don't quite know if Rihanna's post as Creative Director is simply code for 'Brings all the buyers to the yard,' we do know that her presence will surely help elevate Puma to another level of audience. Check out the first advertisement with Rihanna below and let us know your thoughts.